Welcome to Norway's Sognefjord. One of the world's longest and deepest fjords, it is a true force of nature. 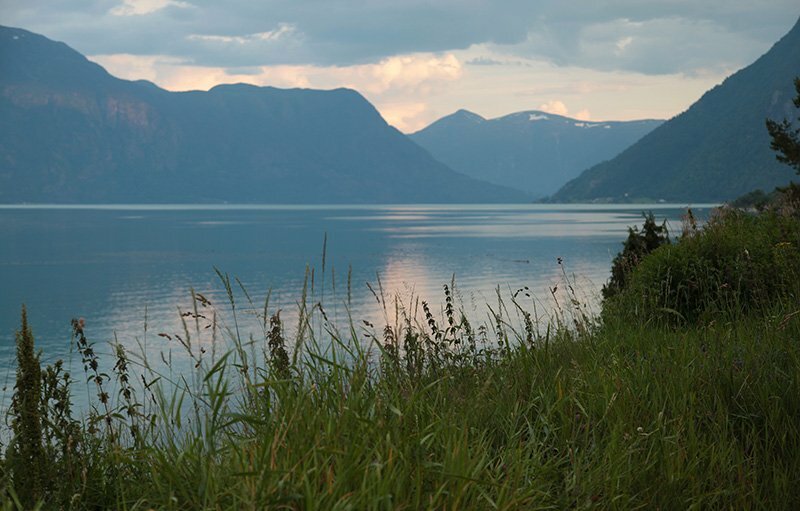 Impossible to miss on a map, the epic Sognefjord splits apart the northwest and southwest fjord region with an imposing 205km-long body of water. 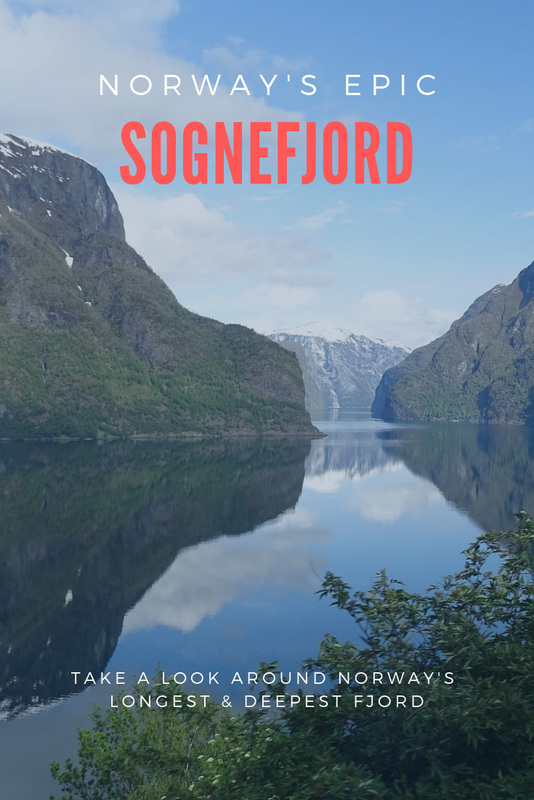 The entire length of the Sognefjord is essentially a living museum. You will find incredible landscapes and hidden cultural gems around every corner. It is one of the most beautiful parts of the country and a must-see for any visitor. The fjord itself splinters off into many smaller arms as it reaches inland, including the famous Nærøyfjord, Aurlandsfjord and Lustrafjord. In this article I'll dig into the entire region to help you plan a dream trip to one of Norway's most picturesque spots. You could spend weeks travelling around the region and still not see everything, so it's best not to try. If ever an area called out for a ‘slow travel' approach, it's this one. You will get so much more enjoyment from spending more time in a well-chosen idyllic village, centuries-old farmstead, abundant fruit orchard or well-worn hiking trail, than you will racing around in a car checking things off a list. 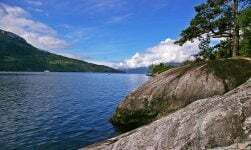 My recommendation is to focus on the inner section east of Balestrand, almost two-thirds of the way along the fjord. It's here that the scenery becomes truly captivating. The Sognefjord’s narrow fingers reach deep inland to the foot of glaciers and some of Norway’s tallest mountains. The most picturesque of the inner Sognefjord’s villages, Balestrand is a great place to base yourself while exploring the wider region. The lush vegetation and colorful timber houses provide a relaxing environment following a day's hiking. Pick up a free map at Balestrand Tourist Information and follow the Culture Trail, a two-mile self-guided walk around the village. Run by the Kviknes family since 1877, the Swiss-style Kviknes Hotel has been expanded over the years but still retains its historic character. The church is a looker, too! 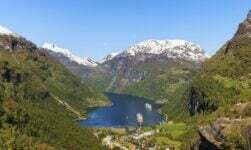 An alternative stop to Balestrand is the pretty village Fjærland, located at the foot of the Jostedal Glacier. In addition to the gorgeous scenery, the village offers visitors a few hidden surprises. A handful of second-hand bookshops give old buildings a new lease of life. Locals claim there is more than two miles of shelving filled with dusty tomes in the village of less than 300 people! The Sognefjord’s two southernmost arms (the Aurlandsfjord and Nærøyfjord) reach into the heart of Aurland municipality, one of the most popular tourist destinations in the entire country. Filled with ancient forest trails and long-abandoned farmsteads, the Aurland valley is a paradise for hikers and cyclists. These fjords are surprisingly accessible by public transport thanks to the remarkable Flåm Railway. 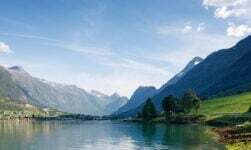 The one-hour journey from Myrdal on the Oslo to Bergen line circles over bridges and through tunnels as you descend more than 800 meters to the tiny community of Flåm. If you’re not on a tight schedule, Flåm itself is worthy of an overnight stop as it's a much more relaxed place once the tourist crowds have gone. Together with the Geirangerfjord, the Nærøyfjord makes up the west Norwegian fjords listing on the UNESCO World Heritage list. The fjord is just 250 meters wide at its narrowest point, with towering mountains either side creating an intimate atmosphere. The most popular way to experience both the Aurlandsfjord and Nærøyfjord is on the boat trip from Flåm to Gudvangen. The trip – most likely on one of Norway's new electric ferries – is part of the Norway in a Nutshell tour but can be taken on its own. 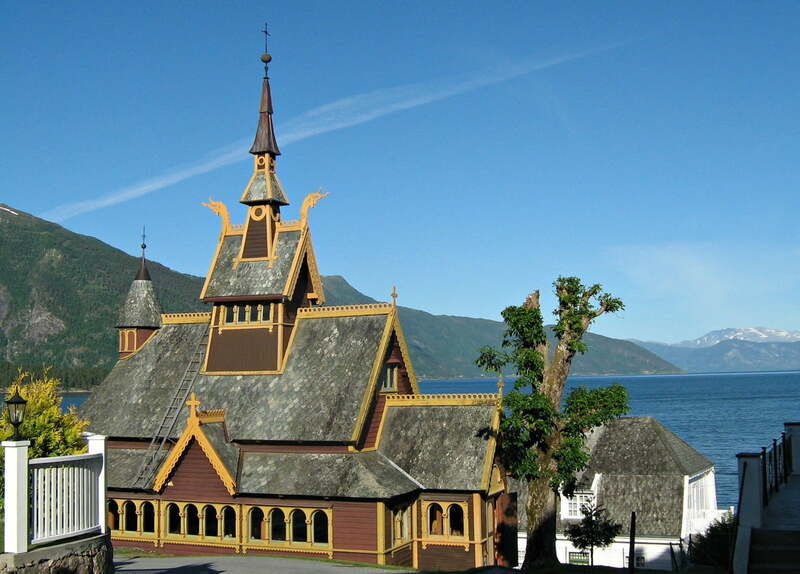 If Norway's stave churches are high up on your bucket list, then the Sognefjord region is for you. Some of the country's best examples of this unique architecture include the churches at Kaupanger and Urnes. The historical heart of the valley, Lærdal suffered a devastating fire in 2014 that destroyed many of its well-preserved timber houses. Plenty remain though, making a stroll around Lærdal a welcome distraction when passing through. Driving this way is highly recommend as two superb driving experiences are nearby. 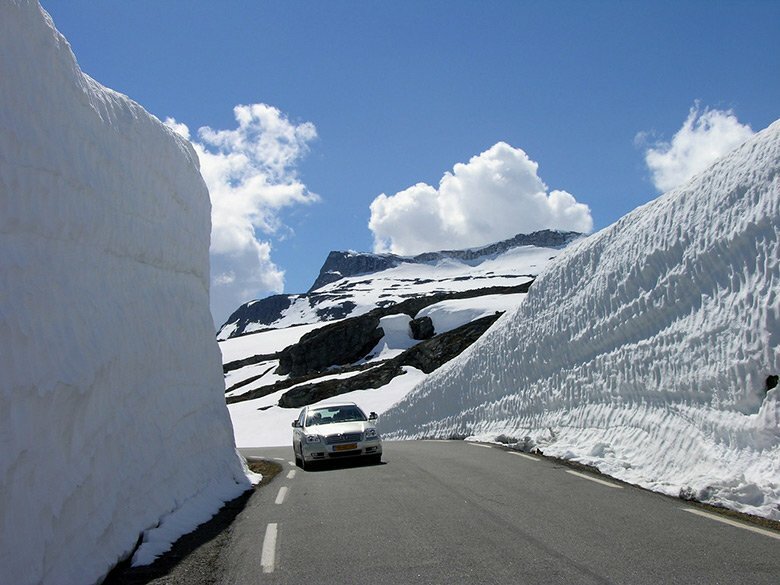 Early in the summer, dramatic cliffs of snow line both sides of the 45km ‘Snow Road', a summer-only National Scenic Route linking Aurland and Lærdal. Allow plenty of extra time for photo stops! If you're in more of a hurry, you needn't miss out. The alternative route is much quicker, but intriguing all the same. At 24.5km, the Lærdal Tunnel is the longest road tunnel in the world. The 20-minute journey is separated into four sections by large caves lit by blue mood lighting and yellow-lit turnaround points. Road trippers, read on. There's more for you yet! Slicing through the Norwegian landscape from the very end of the Sognefjord to central Norway, the Fv55 National Scenic Route is one of the country’s greatest driving experiences and well worth planning a full day for. The road slices through mountainous scenery between Jotunheimen National Park and Breheimen National Park, and past the tallest mountain in mainland Norway. In days long gone, the mountain pass was a dangerous journey, in more ways than one. Inclement weather was a problem at any time of year but essentially in the winter with enormous amounts of snow. But as trade increased along the vital link between coastal and inland Norway, so increased the number of robberies. Today the raw mountain landscape provides the setting for one of the country's most compelling roads trips. 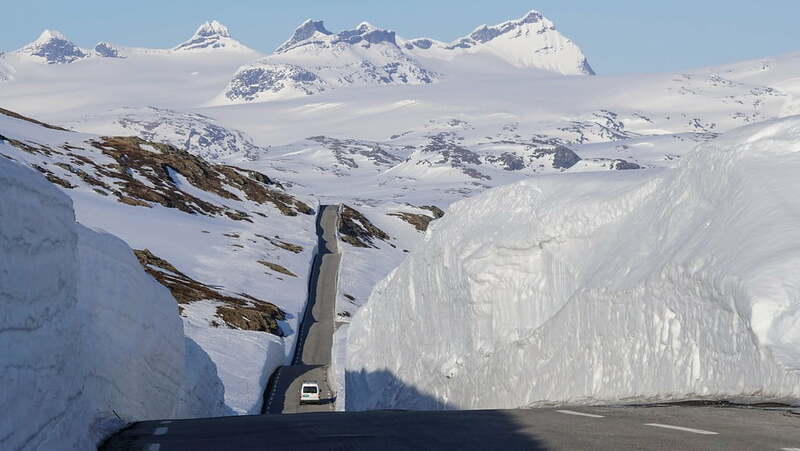 The absolute best time to drive the road is straight after its springtime opening, when enormous banks of snow line both sides of the narrow road. It's an absolutely unforgettable driving experience. Need a place to stay? Check out Røisheim. 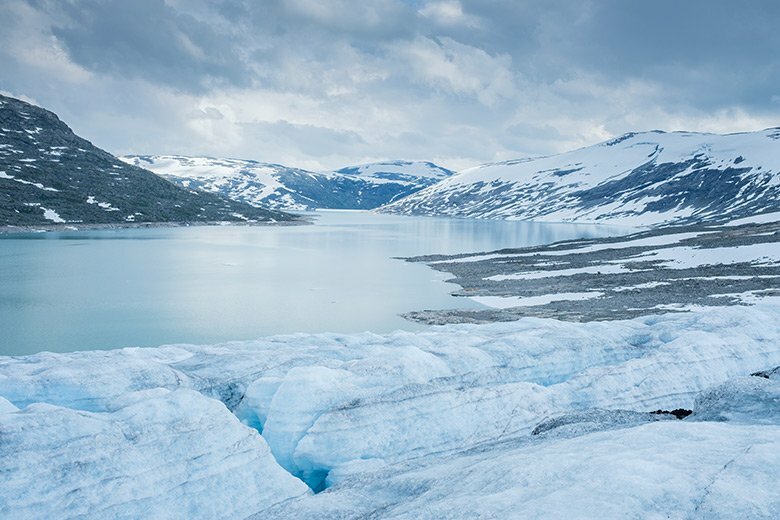 If you want to learn about the last Ice Age there are few better places on the planet than the imposing Jostedalsbreen glacier on the northern side of the fjord. Mainland northern Europe’s largest glacier had for years continued to grow rather than retreat, but in recent years this trend has started to reverse. Even so, the ice still covers an area of around 474 square kilometres and is up to 600 metres thick. The National Park is a nature lovers dream. The landscape ranges from lush green valleys and stunning waterfalls right through to the harsh environment of a glacier. Much of the park can only be reached on foot, so the opportunities for hikers, cyclists and skiers are second to none. At approximately 474 square kilometres, Jostedalsbreen in Sogn og Fjordane county is the largest glacier on mainland Europe. I say approximately, because the rate of shrinking of this glacier in recent years has been quite alarming. Because of the sheer size of Jostedalsbreen, the two most prominent and accessible arms – Nigardsbreen and Briksdalsbreen – are the most common ways of accessing the glacier. One of the best ways to explore the wonders of this fjord is on two wheels. Recent guest on the Life in Norway Show, Mike Emery, told me of a charity cycle ride he's set up to help people do just that. You can find out more about the race at World at Play. 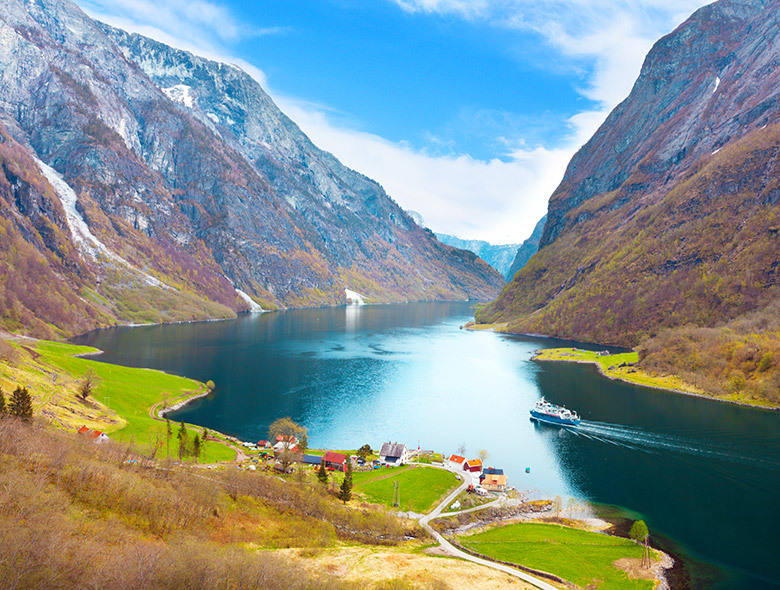 Although driving allows you to enjoy the best the region has to offer, the system of high-speed passenger ferries run by Bergen-based Norled provide an enjoyable alternative as they essentially serve as a sightseeing cruise of the Sognefjord. The five-hour service from Bergen to Sogndal runs all year although there is just one early evening departure during the winter months. 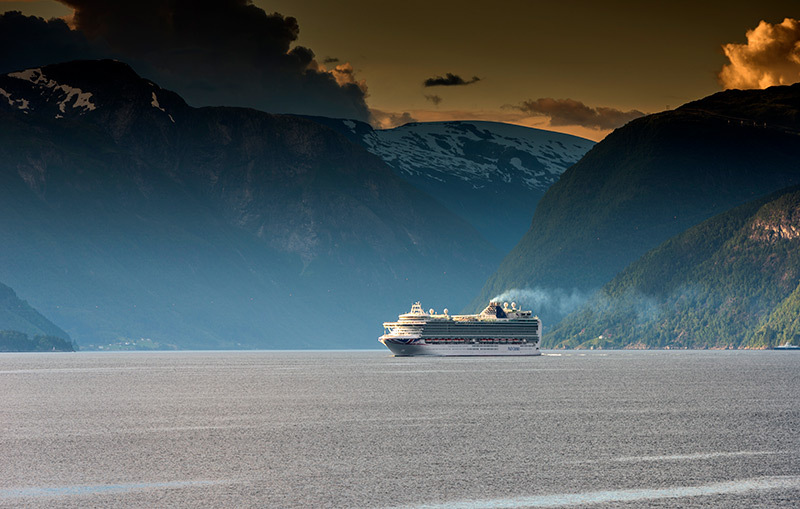 From May to September, an additional service links Bergen with Flåm, via Vik, Balestrand, and Leikanger. This service can be used to travel between the small towns of the Sognefjord, but as departures are limited it’s wise to keep a copy of the timetable on you to avoid an unplanned overnight stop. Individual trips on these ferries can be expensive, but the Norled Fjord Card is one of Norway’s best travel bargains. It allows unlimited travel on the network for five days, but is only available from May to September to coincide with the regional ferry. I have been here several times and I never tire of it. It grabs the senses and won’t let go. Let yourself be drawn into it and you’ll want to come back. Great article,which I shall keep to read again in the winter months. My husband’s cousin lives in Leikanger, and we were fortunate enough to visit this last summer. I’m convinced the most beautiful view on the entire planet is from their house, looking southeast onto the fjord. I can’t wait to go back! 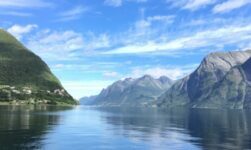 On my first trip to Norway in 1969 we sailed the Sognefjord, as well as other times and to this day can still recall the beauty of what lay before my eyes. We visited the stave churches, the glacier near Mundal and enjoyed each and every moment. It is an experience everyone should do if visiting Norway and will change your life forever. God really blessed Norway with a land of unforgettable landscape and beautiful people.